From the main iTunes Connect page for your app, click on Game Center in the menu bar at the top of the screen. It will bring up a screen similar to that shown, below. You can see the leaderboard has already been created in this screenshot. Leaderboard Reference Name: this is a name used for reporting only. Use a name that makes sense to you, as the public will never see it. Leaderboard ID: this is the ID you put into BuildBox. I can have letters, numbers, dots and underscores. Score Format Type: The type of score. Integer is usually the best. Score Range: An optional maximum and minimum value to screen out invalid scores submissions. Be careful if you set this as you can inadvertently reject legit players of your game and not just people cheating. Click [Add Language] and a popup will appear. Language: The language you are defining the leaderboard display for. Always do at least one leaderboard with English. Name: Name that will be used in the App Store and in-game. 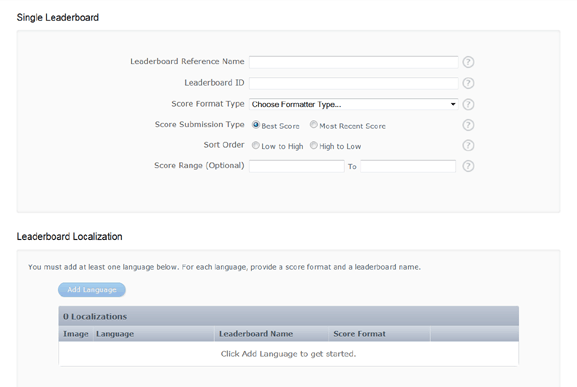 Score Format: Choose the format you prefer for scores. Score Format Suffix: Whatever you enter in tis optional field will be added to the end of the score. For examples would be coin, coins, eyeballs, dollars, meters. Score Format Suffix (Plural): If you set the above setting and use a singular work – like coin for example – then you would put the plural version here. The plural for the coin example would of course be coins. Image: You can upload an image optionally to display in-game and on the App Store next to this loaderboard. It should be a jpg or png file of size 512 x 512px or 1024 x 1024px. Hit [Save] to finish entering the text. Lastly hit [Save] on the main leadboard screen to finish. The Leaderboard – while setup – will NOT work until you enable it on the Version tab of the main game screen. Near the bottom of the page, you will find a heading “Game Center”. If the switch next to this is grey, it is disabled. Press the switch next to Game Center. It will turn green, and the heading Leadarboards will appear. 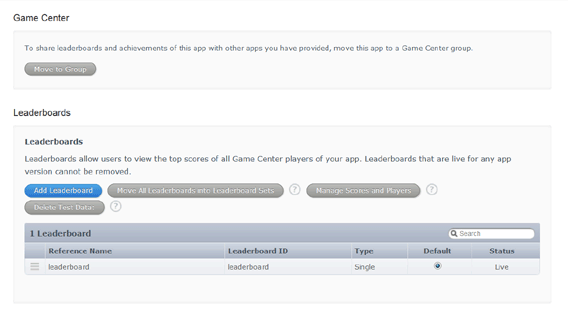 Under the message “You don’t have any new leaderboards for this app”, there is a link – View Game Center. Click this and you will see another screen come up.